Worker of the Month. 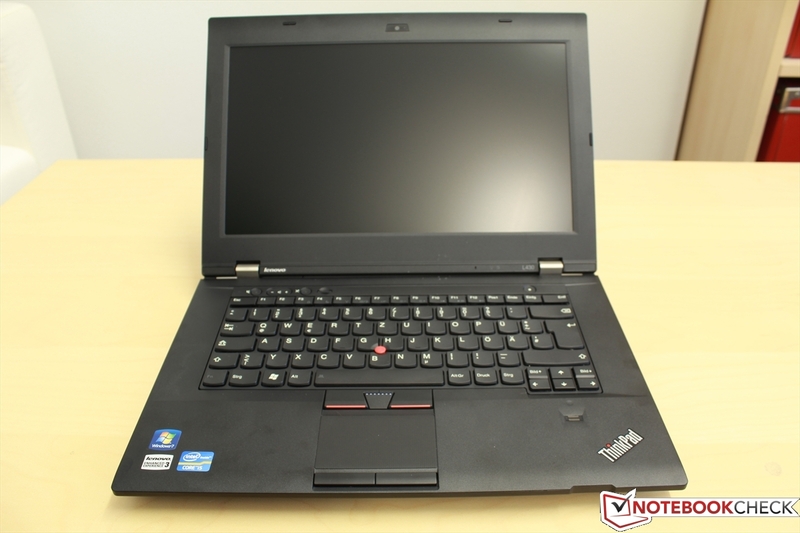 The Lenovo ThinkPad L430 is a true office notebook. 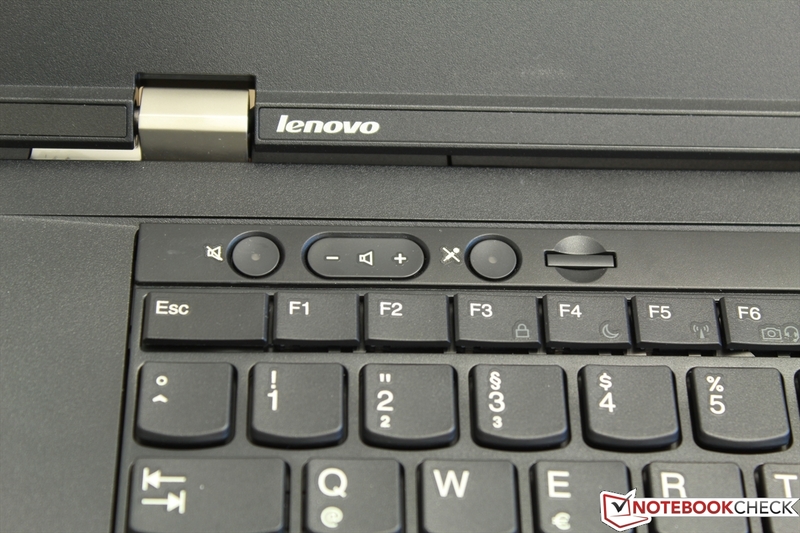 Lenovo has paid special attention to making this model practical and giving it clever extras. So do these make everyday office work easier, or is a coffee machine the better investment of the 840 Euros (~$1089)? Find out in the following review. A mountain of work ahead? 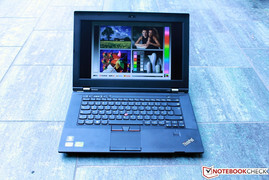 The Lenovo ThinkPad L430 may be the right companion for the road. 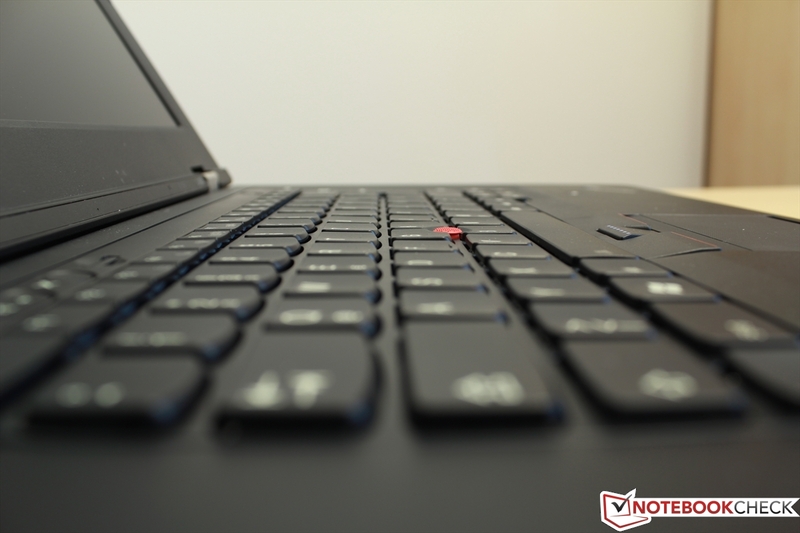 Nowadays, special features like fingerprint readers or the touchpad alternative, the TrackPoint (a red button in the middle of the keyboard), are standard features of the ThinkPad series. 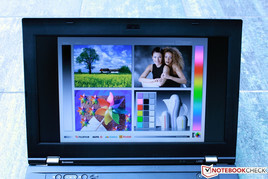 As such, it is no surprise that the L430 has a very similar design and functionality as its predecessor, the Lenovo L420. The competition is fierce: the Dell Vostro 3460, the Lenovo ThinkPad Edge S430, the Acer TravelMate P643 and more. Can our test model keep up or even surpass the others? Find out in the following review. ... with attention to the details. The L430 sports a "classic" look. That would be the opinion of those who favor this model. Critics would describe its looks as "outdated", which is understandable. The thick border around the monitor, the dark plastic and unadorned design could have all been taken from a 10-year-old laptop. In contrast, the build quality is impressive: no gaps and the display is stiff. It does not wobble when adjusted and the laptop even closes elegantly. A groove at the front makes opening the notebook easy. 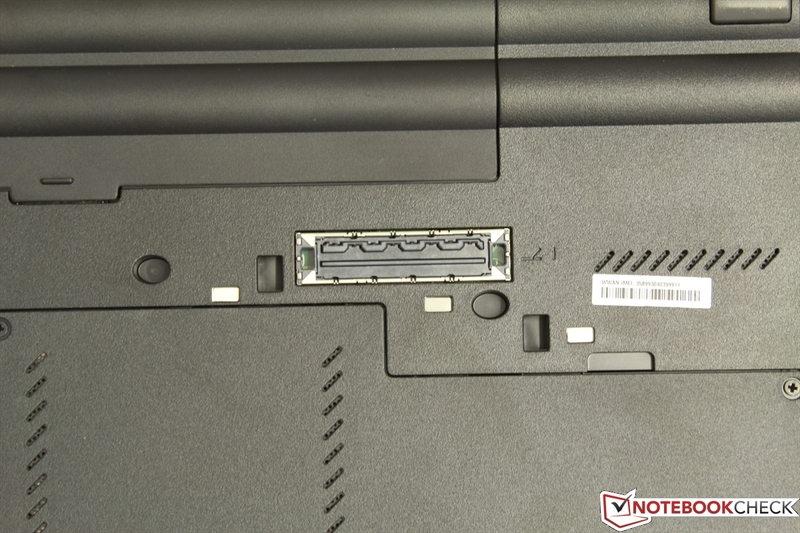 The battery is secured with a latch mechanism, and the insides of the laptop are two screws away. The bottom boasts a docking interface. Imperfectly, the dark plastic is a magnet for fingerprints. These find their way onto the laptop quite easily, yet are hard to remove. The device makes one thing clear: it wants to be reliable, not cute. 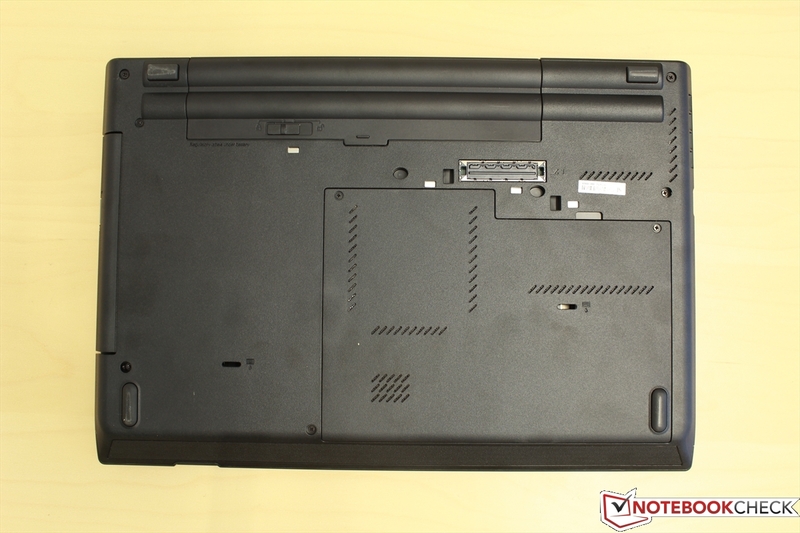 Overall, the laptop has great workmanship. The interfaces of this laptop are well-positioned. USB ports are distributed on the left and right side, and one of them is even a powered USB 2.0. If the buyer, like us, chose not to add on an Express Card, s/he will find a piece of solid plastic in its place. The notebook has no HDMI but a mini DisplayPort, like Apple devices. An adapter is required to use the DisplayPort or HDMI. The use of the 4-in-1 card reader is a bit tricky. The memory cards have to be pushed quite far into the slot. Most users will require a lot of force to get the card into place. The Gigabit Ethernet LAN and power-in are placed at hard-to-reach spots. Both can be found on the rear of the laptop. Lenovo probably had desktop and docking station users in mind. The ThinkVantage Virtual Camera (5 megapixels) is placed above the screen. Videos can be recorded at 720p. Thanks to the face tracking feature, the camera delivers a stable picture. The microphone records sound well, even from afar. However, the automatic volume control will have a hard time keeping up if the user keeps changing his/her position. A 1x1 WLAN adapter (wireless speeds up to 72 MB/s) and a Realtek Ethernet Controller (placed on the back) promise stable Internet use. 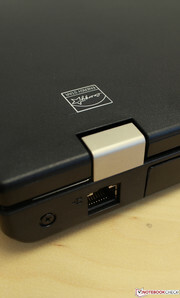 The laptop offers a Kensington Lock for physical security. The connection for the chain can be found near the back on the right side. 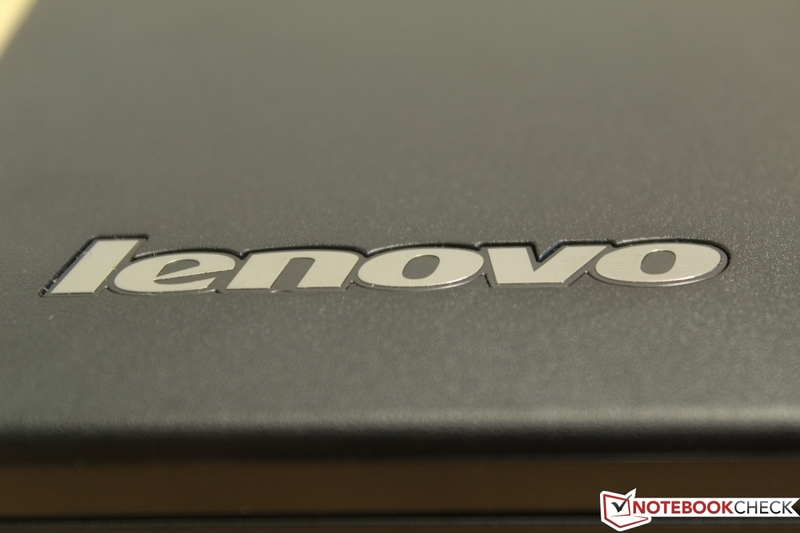 To secure files on the L430, Lenovo has provided a fingerprint scanner. 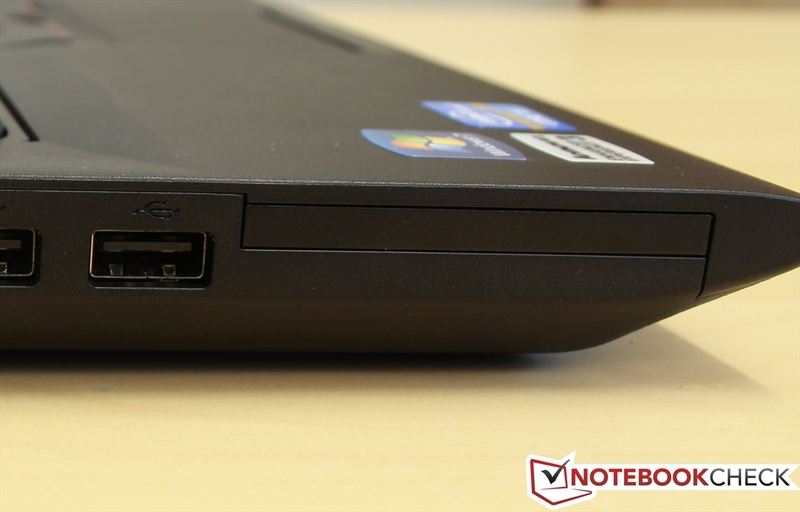 Lenovo packs a quick-start guide alongside the laptop and charger. 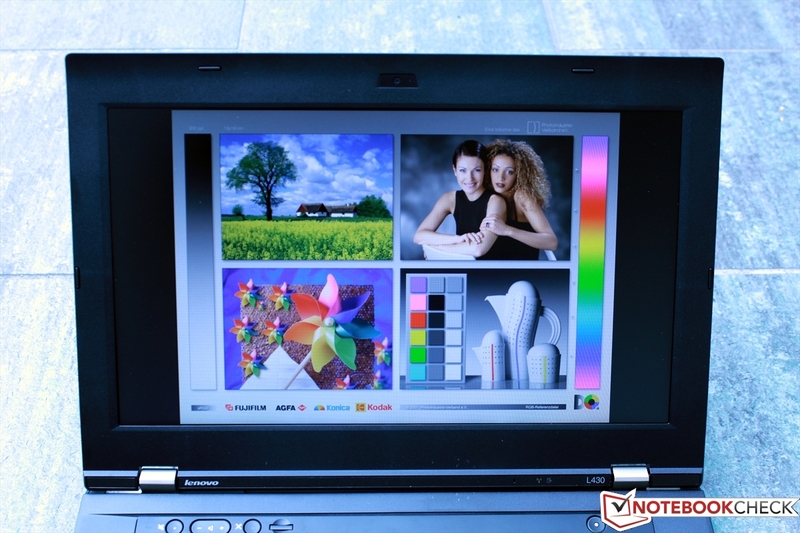 Lenovo has chosen to be environment-friendly by not including a printed manual. Multiple Lenovo docks (price: 77 to 208 Euros/~$100 to 270 [EU docks]) are compatible with the L430. 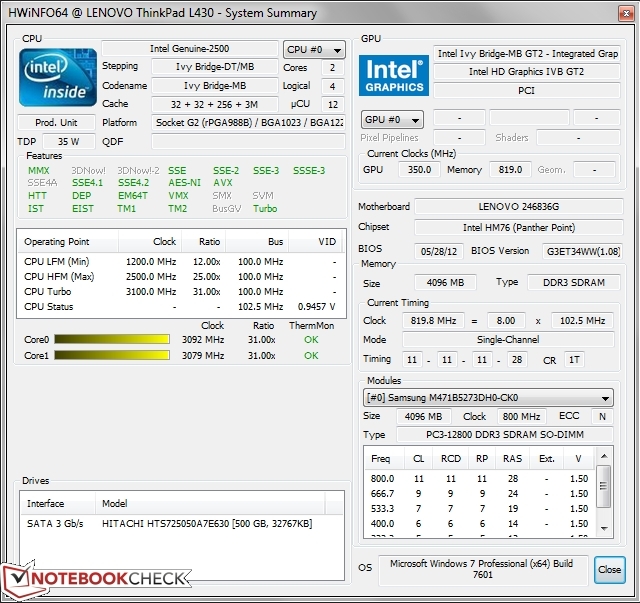 The manufacturer has installed the ThinkVantage packet on the laptop. This includes a desktop replacement, which looks similar to Windows 8, a program for power options and connections and a recovery partition on the hard disk. 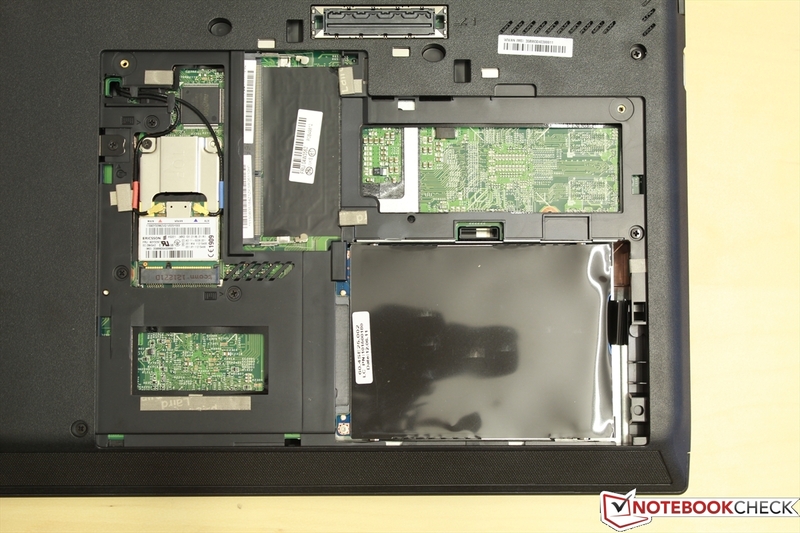 After removing two screws and getting past the clamps, the hardware of the laptop lies exposed. The user can access the hard disk and an empty slot for additional RAM. The fan is hidden in a corner and is not so easily accessible. The basic warranty runs for 12 months, which, depending on the exact model, can be extended up to 5 years. 221 Euros (~$286) is the premium required for the full support packet (on-site repair; the hard disk stays with the user). Buyers who are satisfied with less, can get an extension for the same time for 178 Euros (~$231). The L430 is a work laptop, which makes user-friendly input devices a must. The user will not be let down: 19 x 19 mm keys with a slight curve inwards offer the ideal pressure point. 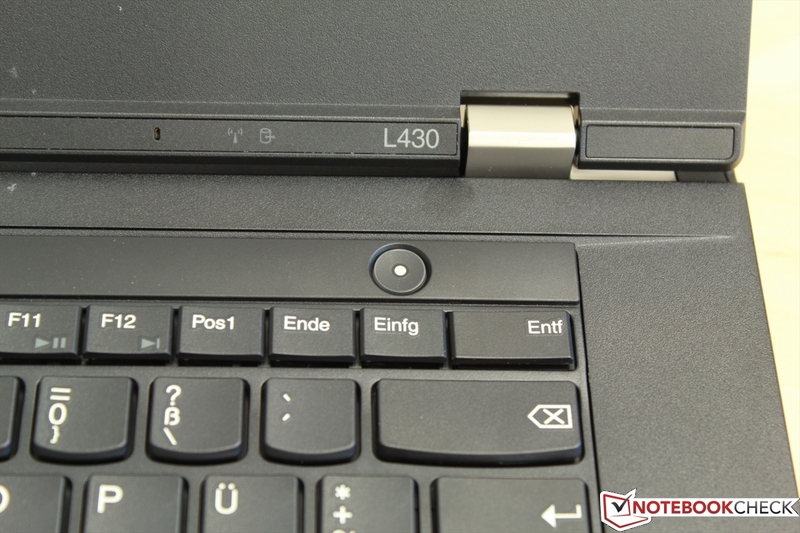 There are gaps between the keys, which would not be found in the L420. It seems Lenovo has accepted this design trend. The blue Enter key has also vanished. The new ThinkPad features may require some getting used to: the control and function keys have swapped places. On the bottom left, we have the Fn key and to the right we have the CTRL key. The controls for the volume and the microphone are placed far left of the power button, above the keyboard. 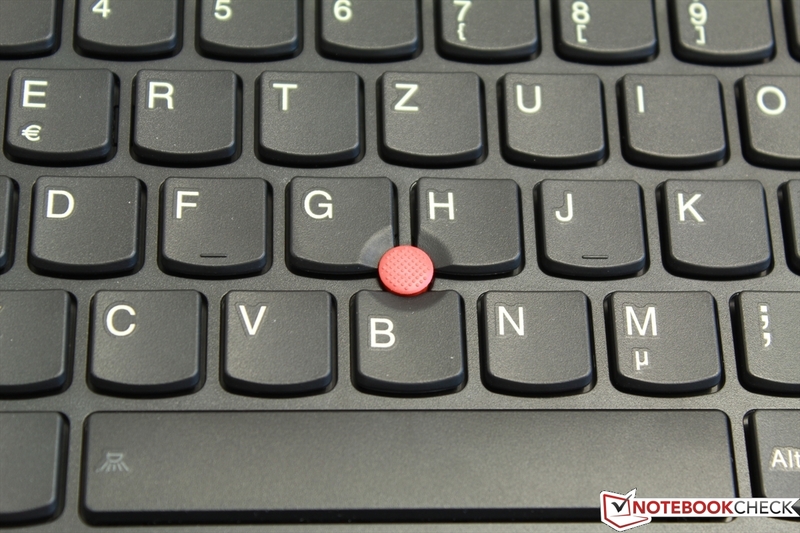 Twice the mouse control: the ThinkPad series is famous for offering a touchpad and a "TrackPoint stick" - this would be the red button between G and H on the keyboard. The surface of the touchpad is covered with multiple points. This makes the surface slightly rough to the touch and gives haptic feedback when the finger is moved over it. The touchpad is small: 76 x 45 millimeters (87 mm diagonally/3.4 inches). Thankfully, it supports multi-touch gestures. The mouse keys are a little rounded and offer little resistance. The clicking noise is very quiet and should prove suited to the office environment. 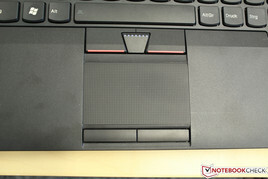 The touchpad is limited in size due to the three keys placed directly above it. These belong to the TrackPoint. 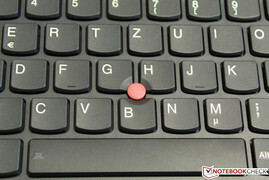 The small red point in the middle of the keyboard is made of rubber and enables accurate navigation. The respective mouse keys are quite large and placed right below the keyboard for quick access. In contrast to the predecessor, the design of the buttons has changed a little but the overall concept has stayed the same. The 16:9 display is 14 inches and has a thick border. 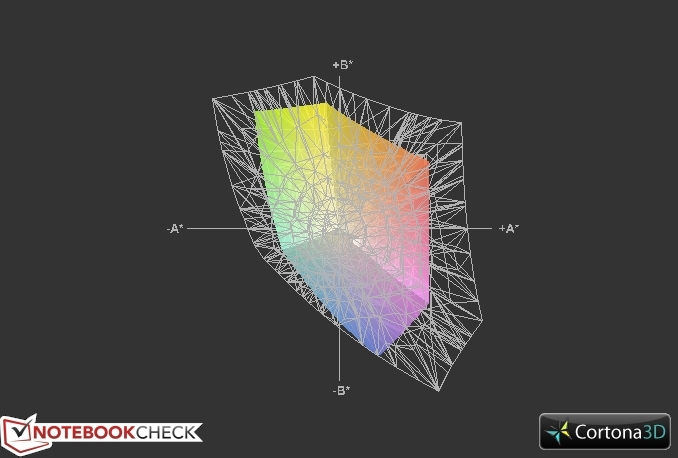 A resolution of 1600x900 pixels translates to a pixel density of 131 dpi. 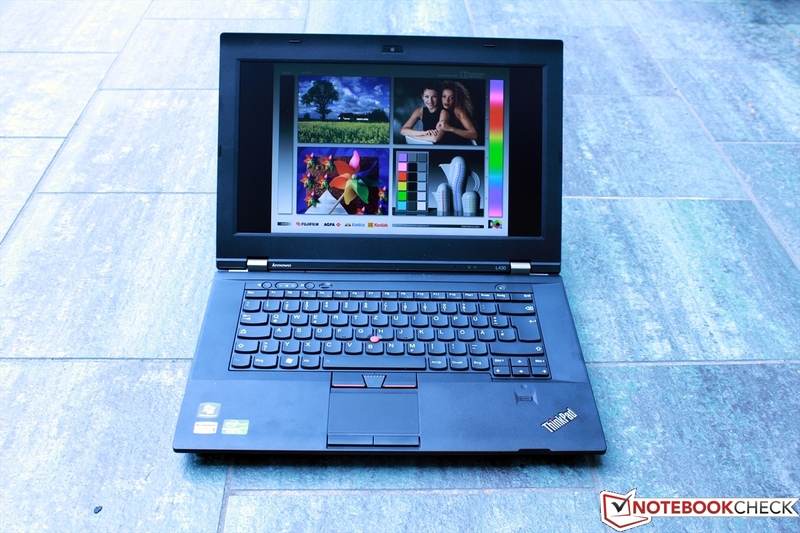 This is the same resolution as the T430 and is higher than most of the competition. If the text size is too small for you at this pixel density, Lenovo offers a lower-quality 14-inch display (1366x768 pixels). Note: the screen can be opened up to 180 degrees. The manufacturer says the panel has a brightness of 250 cd/m2 - our measurements go up to 300 cd/m2. This is an excellent value, especially compared to the other laptops (such as the Dell Vostro 3460 or the Acer TravelMate P643). 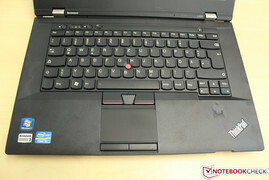 The expensive Lenovo ThinkPad T430 is also surpassed. The black value and illumination (83%) are not as impressive, but both are at least decent values. The contrast of this test model surpasses its big brother. As such, we can say that the two screens are of similar quality. The matte display and high brightness ensure good legibility outdoors. The colors remain clear even in the sunshine. Additionally, the thick border of dark plastic creates a contrast between the picture and the laptop. Thus, the ThinkPad performs quite well outside of the office as well. The L430 is good outdoors. We expected a lot of the display after seeing such great results. That is why we were really disappointed to see how poor the viewing angle stability is: the picture quickly distorts and the colors reverse. This should not be a problem while working at a desk or with the docking station. However, if the user moves the laptop around, the poor stability will become apparent. This flaw is primarily limited to the vertical viewing angles since sideways the picture remains stable over a wider angle. The picture is not ideal, as can be seen from the pale borders. It is clear what the L430 is made for: a work laptop which offers all the performance needed for the office. 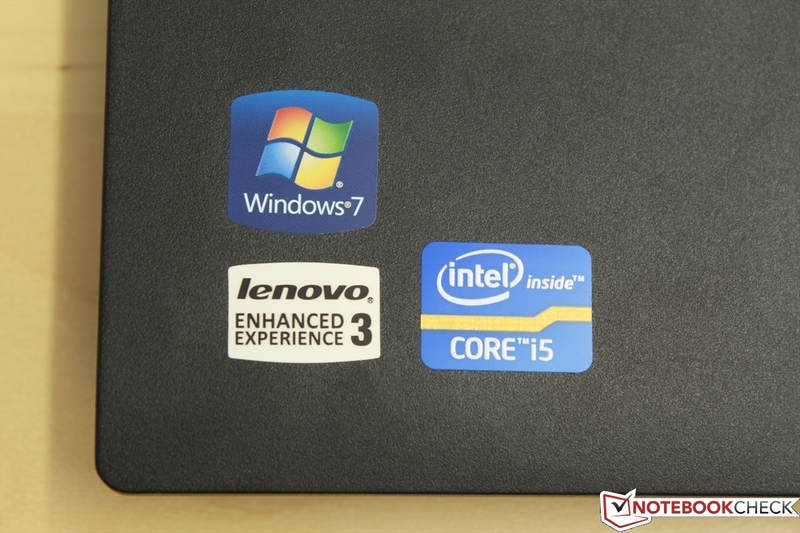 An Intel Core i5-3210M and Intel HD Graphics 4000 are installed in this test model. Although it is clear that this laptop was intended for work, we will experiment a little and see how well it does with games. Let us first take a peek at the insides of the laptop. This case houses the Intel Core i5-3210M which is based on Ivy Bridge architecture. 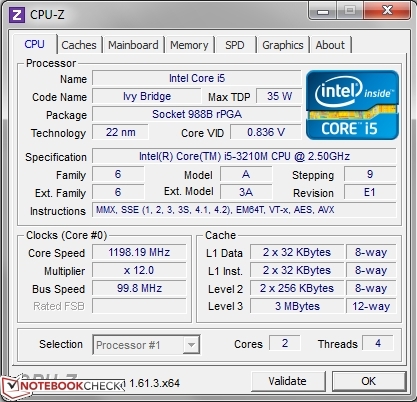 This dual-core runs at a standard 2.5 GHz, but can be pushed up to 3.1 GHz thanks to Intel Turbo Boost. 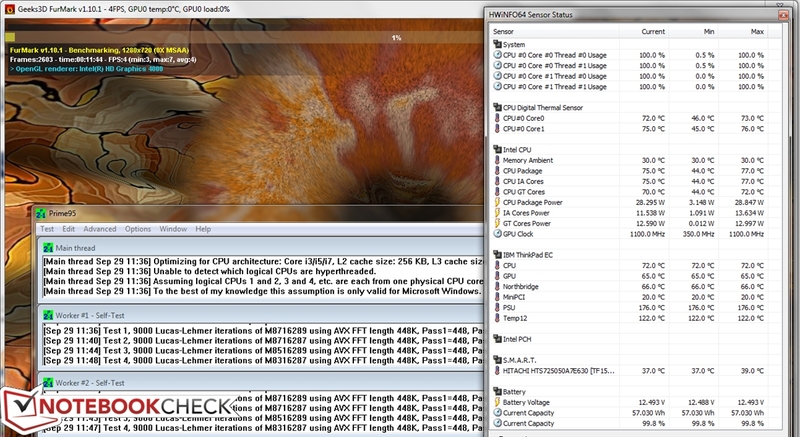 In our stress test (Prime 95 and FurMark run simultaneously), the processor reached 2.9 GHz. In Cinebench, the L430 can keep up with most of its competition (for example, the Dell Vostro 3640 with an Intel Core 2 Duo T9400). 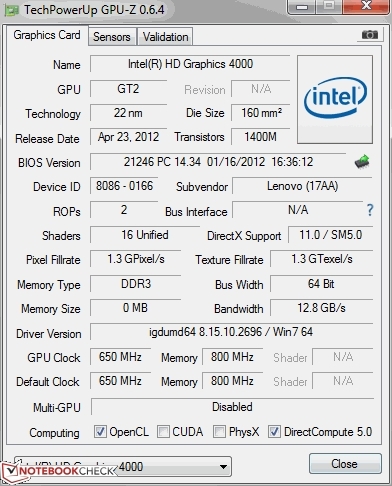 However, its predecessor, the L420 (Intel Core i5-2520M) is stronger in the rendering test. 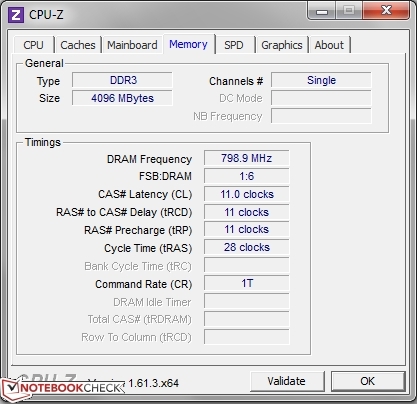 In the single-CPU benchmark, the full power of the 3.1 GHz could be seen from time to time, but not consistently. PCMark Vantage shows that although our test model is in the same league as the competition, it can only clearly surpass the Acer TravelMate P643. As expected, the predecessor, L420, is also beaten. 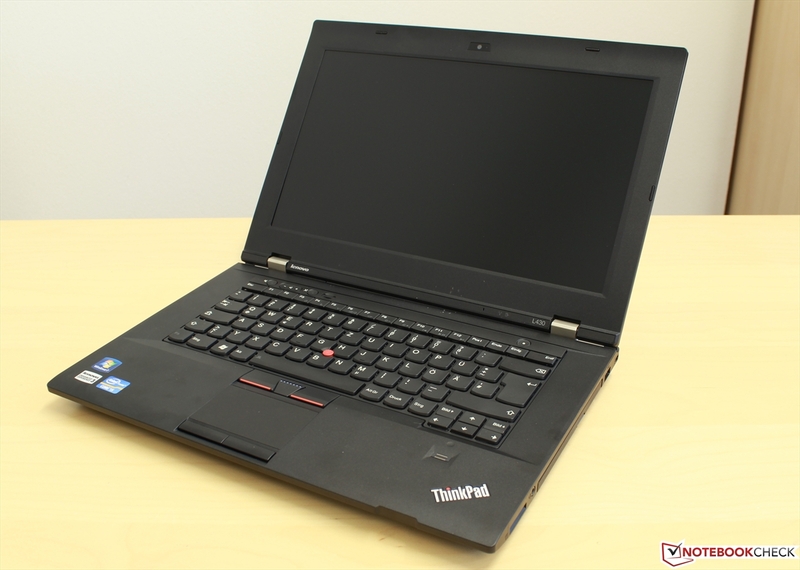 However, our test model cannot even come close to the "ideal competitor", the T430. This is due to the storage device of that model. The buyer will have to decide if a 20% higher score is worth twice the money. From a practical point of view, the L430 can take you quite far. It runs out of gas when programs which require high graphics performance are run. This test model holds the Hitachi Travelstar Z7K500 HDD (500 GB). This hard disk runs at 7,200 rpm. 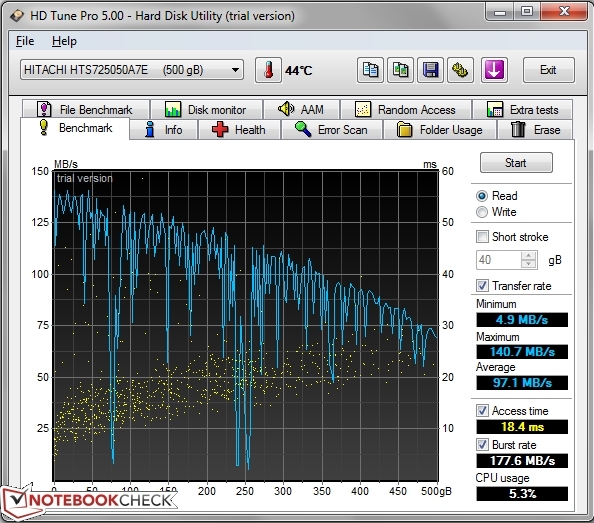 In the HD Tune benchmark, the device reached an average transfer rate of 97.1 MB/s. The installed HDD is one of the faster models. 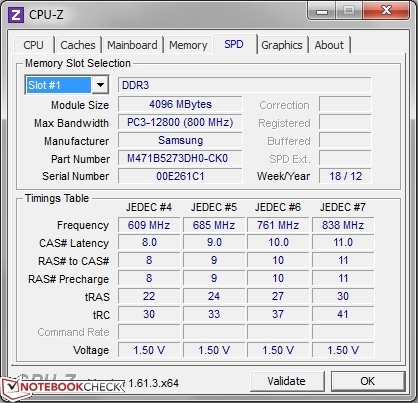 An increase in performance would be possible if an SSD were installed. This would significantly reduce boot and load times. The Intel Core i5 offers the Intel HD Graphics 4000 IGP (Integrated Graphics Processor). This chip runs at 650 MHz and supports DirectX 11. 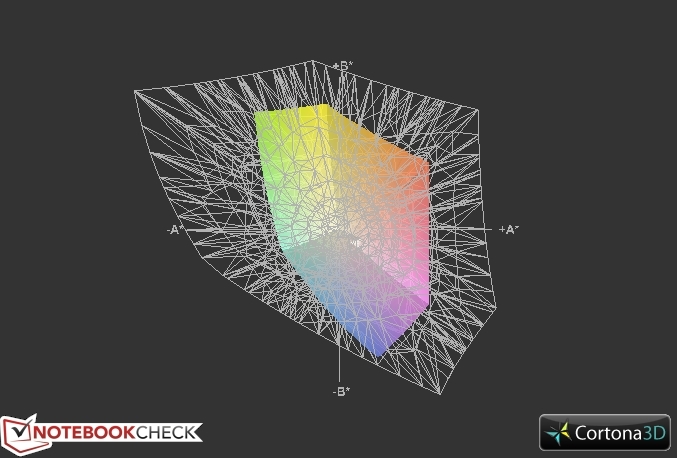 In 3DMark 06, the IGP placed in the lower middle-class. 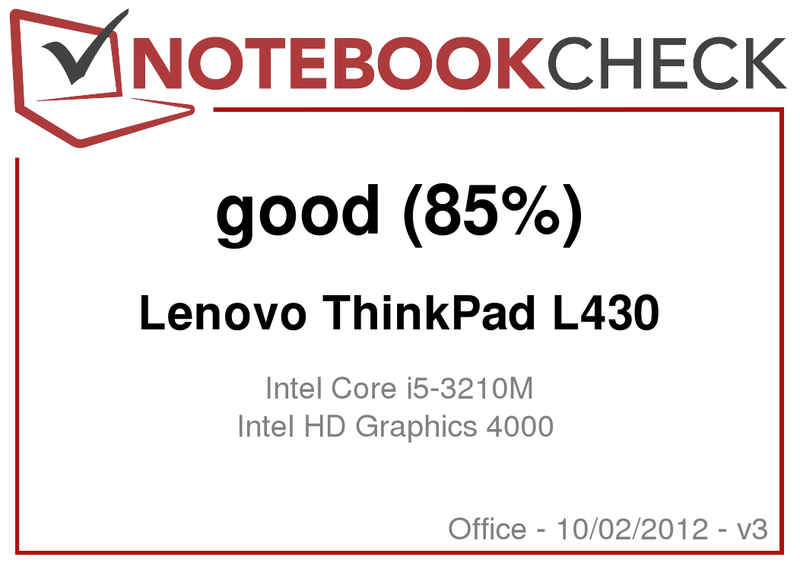 It scored twice as much as the ThinkPad L420, which used an Intel HD Graphics 3000 IGP and not the 4000. In our benchmark table, many of the similarly equipped laptops place in the same area as our test model. The Dell Vostro 3460 and the Acer TravelMate P643 can score about twice as much with their dedicated graphics cards (Nvidia GeForce GT 630M and Nvidia GeForce GT 640M respectively). As was clear from the start, the ThinkPad L430 cannot keep up in this area. Work is half of life - the other half can be spent on games. This is possible with the ThinkPad L430, but the user should not expect amazing gaming performance from this CPU/GPU combination. In our test, Diablo 3 and Anno 2070 ran at acceptable frame rates with low graphic settings. If the resolution and graphics are raised to medium, the games are merely "playable". 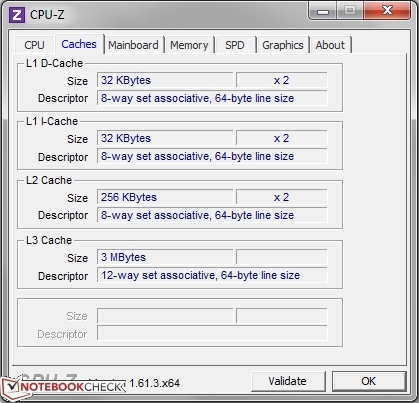 Heavy stutters kick in at high or extreme settings (tested at the highest resolution possible) and this is no surprise as the laptop is not designed to take on such graphics-intensive programs. We also noticed that as soon as the screen gets filled with a lot of action, the frames drop radically. This is especially clear in Anno 2070, where, at medium settings, the frames even dropped to single digits. In short: the test model has enough power for the occasional game. The L430 is comfortably quiet - while idle, the emissions stayed at 30.5 dB(A). The hard disk emits 31.2 dB(A) - slightly louder. 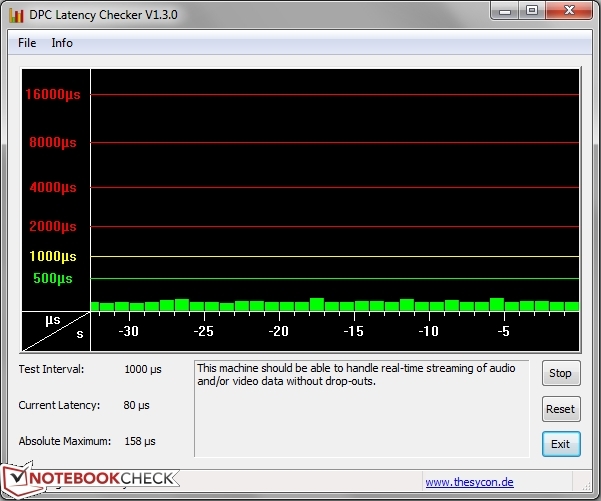 At load, the laptop can reach up to 35.2 dB(A). The loudest part of the test model would be the DVD drive which emits 35.7 dB(A). Overall, a good result - especially for the office. While idle, the only area of the surface which goes above 30 degrees Celsius is the touchpad. Interesting fact: the front of the laptop gets cooler at load, when the cooling system is operating at maximum speed. Diagnosis - heat congestion due to low fan speed while laptop is idle. During the stress test, and while the laptop is idle, certain points on the case get quite warm. This indicates that the touchpad is not alone. While idle, the temperatures remain within one degree Celsius of each other, but at load, the gap increases to 7 degrees Celsius (Comparison: bottom top right and middle). All-in-all, the test model can get warm on the lap, but the temperatures on the top remain at comfortable levels. The charger of the test model can hit up to 53.2 degrees Celsius, which is similar to the predecessor. On the inside, the CPU can reach up to 77 degrees Celsius while running the FurMark and Prime95 stress test. Along the front we have the stereo speakers. The volume is as good as the looks. It is appropriate and not too loud. Due to the slightly tilted placement, a lot of the potential is lost. This is noticeable once the laptop is lifted. The sound output has solid highs but weak bass. 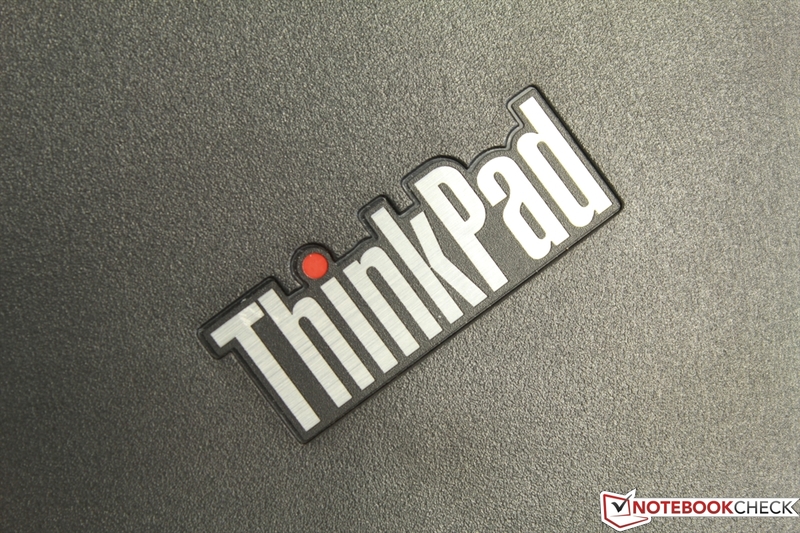 The ThinkPad L430 is conservative and consistent with its power consumption. While idle, it consumes 6.8 W - no other competitor can perform this well. The maximum consumption while idle (12.6 W) is higher than a few of the competitors, but that only means that the average power usage of 11.3 W lies in mid-field. The second attempt for the low power crown is at load. The L430 succeeds by using less power than other similarly equipped laptops - a nice development. The Lithium-Ion battery, which complements the shape of the laptop and does not stick out at any spot, is a 6-cell battery. It delivers 57 Wh. In the Battery Eater Pro test, the idle run time was a impressive 7 hours and 11 minutes. This run time is reached thanks to the extensive power options of the Lenovo Energy Manager. This manager offers a variety of profiles for all possible situations. Each profile regulates the performance, system temperature, fan level and the power consumption. Thanks to the manager, the laptop will only deliver power to the DVD drive when it is in use. This makes the switching of profiles quite useful. Surfing on the Internet with standard settings, the laptop can run three and a half hours. While playing a DVD, the laptop lasts 2 hours and 10 minutes. At load, the notebook expires after slightly more than 90 minutes. Once depleted, the battery requires 127 minutes to recharge completely while the laptop is on. 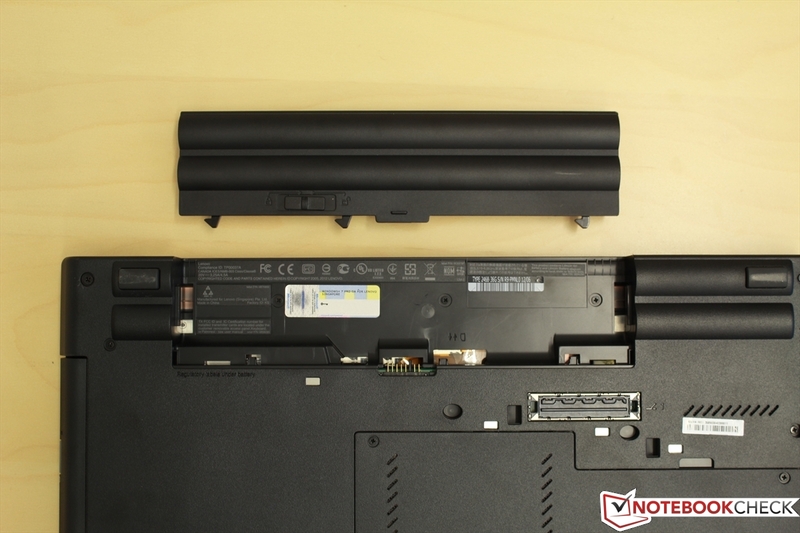 Users who want a higher run time for their laptop can pick up the 9-cell battery. 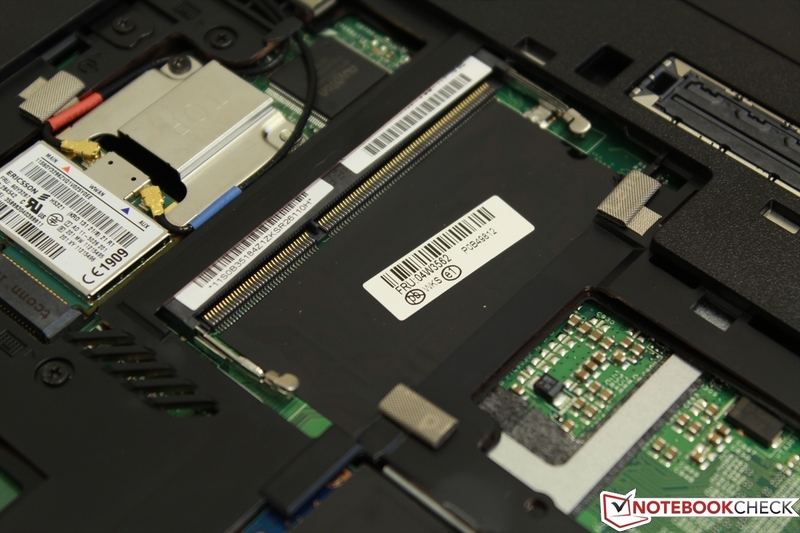 A few configurations of the ThinkPad T430 are delivered with this battery. Unfortunately, the three additional cells require more space and thus make the 9-cell battery much bigger. 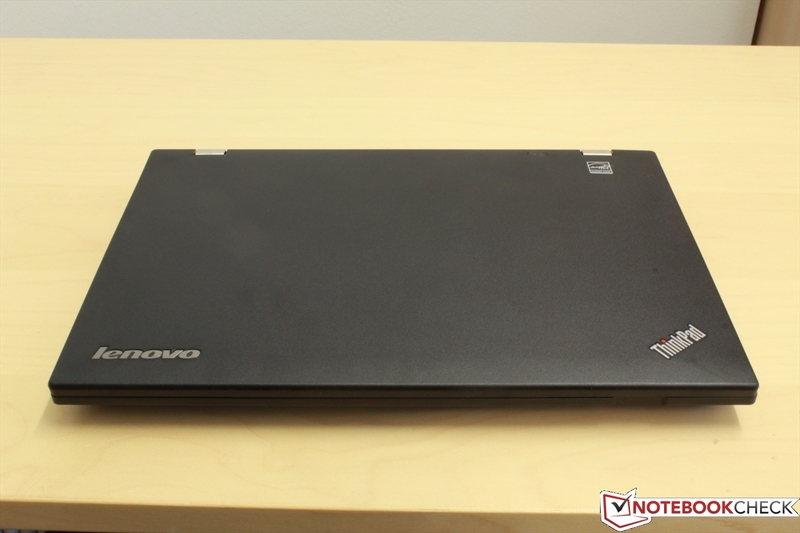 The Lenovo ThinkPad L430 stays true to its fan base. It is a true business notebook and is sure to be a delight for business users. 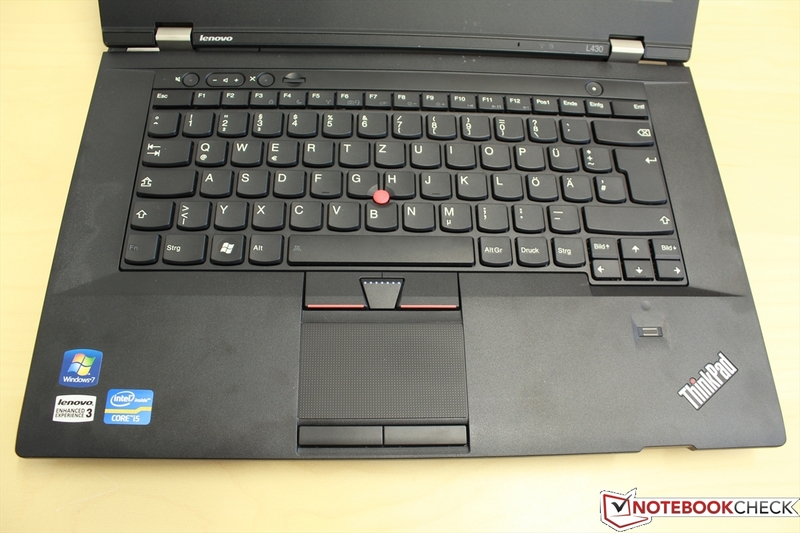 In this review, we dealt with a laptop stripped to the essentials: gone are the playful mouse keys, the blue Enter key and the majority of the media keys. 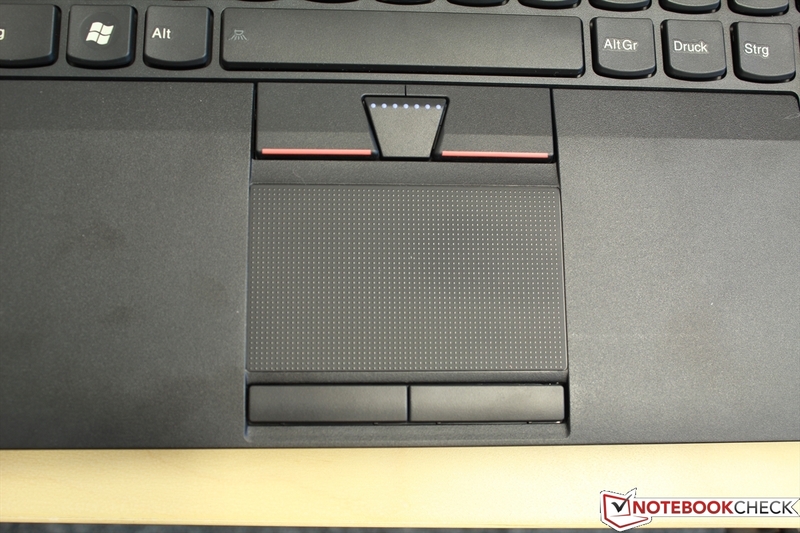 Lenovo decided to invest in clever details and unique features, instead of an awe-inspiring interior. However, that does not mean that the CPU, GPU and RAM are outdated. The solid, yet slightly old-looking case has great build quality. The keyboard, touchpad and TrackPoint have been designed intelligently and have a lot to offer. 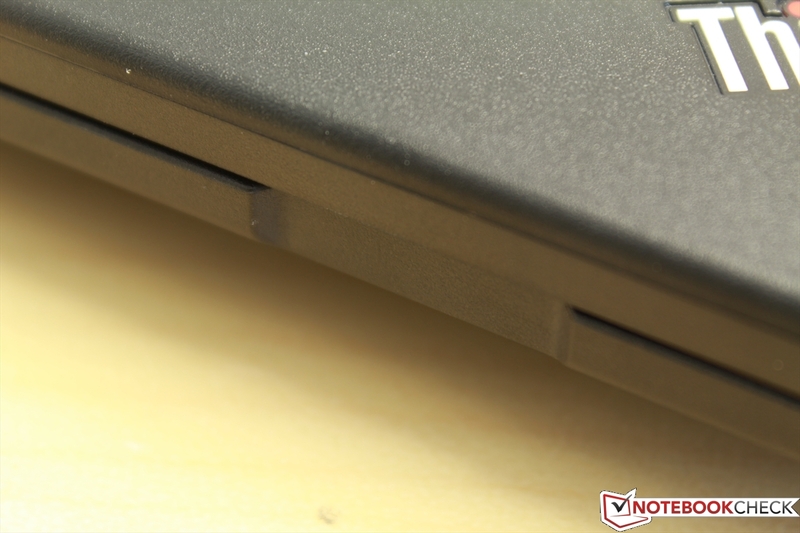 The small details make the L430 a truly attractive laptop. In the wild, by which we mean the office jungle, the low noise emissions and power consumption are a blessing. Sadly, these are countered by high heat emissions. In short, this test model represents the next level. 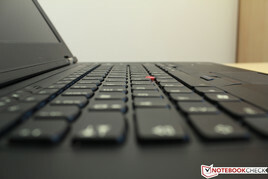 Lenovo has learnt from the predecessor and presents us with the ThinkPad L430: a laptop which does not need to hide from the ThinkPad giants of the past. The battery has a latch. ... with a Dock interface. Camera with face tracking functionality. The power button - a loner. Controls for the speaker and microphone. Silver hinges to black plastic. 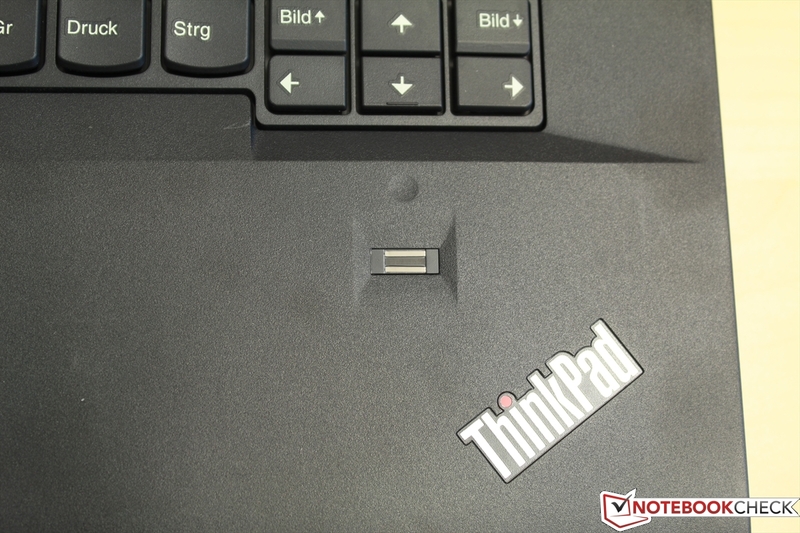 A ThinkPad through and through. Slot for a PC card? Wrong! Keyboard, touchpad and Trackpoint have a clever design and are easy-to-use. The low noise emissions are a delight as is the low power consumption. Despite having a mini DisplayPort, we would have liked to see a HDMI output as well. 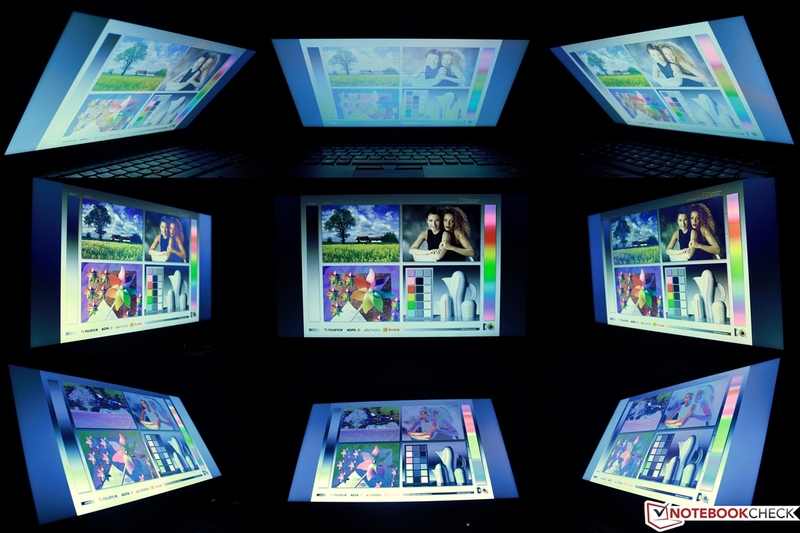 The display shines due to the high brightness.